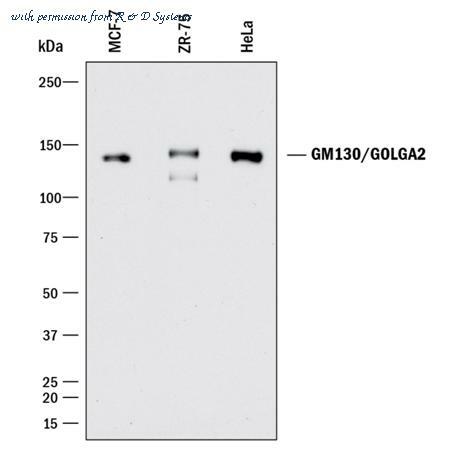 The GOLGA2/GM130 antibody from Proteintech is a rabbit polyclonal antibody to a recombinant protein of human GOLGA2/GM130. This antibody recognizes human,mouse,rat antigen. 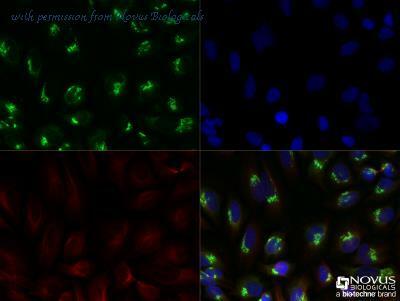 The GOLGA2/GM130 antibody has been validated for the following applications: ELISA, WB, IHC, FC, IF analysis. Immunofluorescent analysis of GM130 using anti-GM130 polyclonal antibody (Product# PA1-077) shows staining in HMVEC Cells. 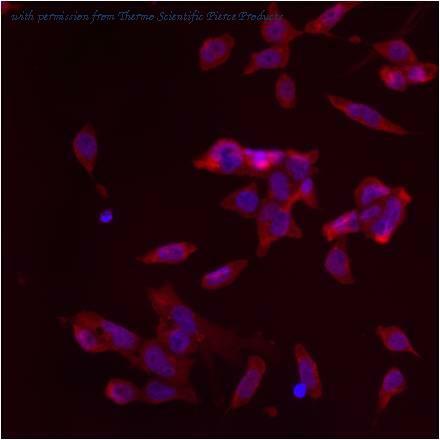 Immunofluorescent analysis of GM130 using anti-GM130 polyclonal antibody (Product# PA1-077) shows staining in p19 Cells. 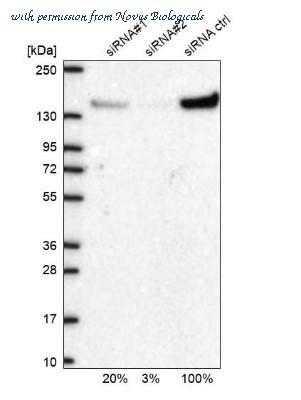 Western blot detection of GM130 from 50 µg of Hela cell lysate, using PA1-077. Detection of Human GM130/GOLGA2 by Western Blot. Western blot shows lysates of MCF-7 human breast cancer cell line and ZR-75 human breast cancer cell line. PVDF membrane was probed with 0.25 ╡g/mL of Sheep Anti-Human GM130/GOLGA2 Antigen Affinity-purified Polyclonal Antibody (Catalog # AF8199) followed by HRP-conjugated Anti-Sheep IgG Secondary Antibody (Catalog # HAF016 ). A specific band was detected for GM130/GOLGA2 at approximately 130 kDa (as indicated). This experiment was conducted under reducing conditions and using Immunoblot Buffer Group 1 . Detection of Human GM130/GOLGA2 by Western Blot. Western blot shows lysates of MCF-7 human breast cancer cell line, ZR-75 human breast cancer cell line, and HeLa human cervical epithelial carcinoma cell line. 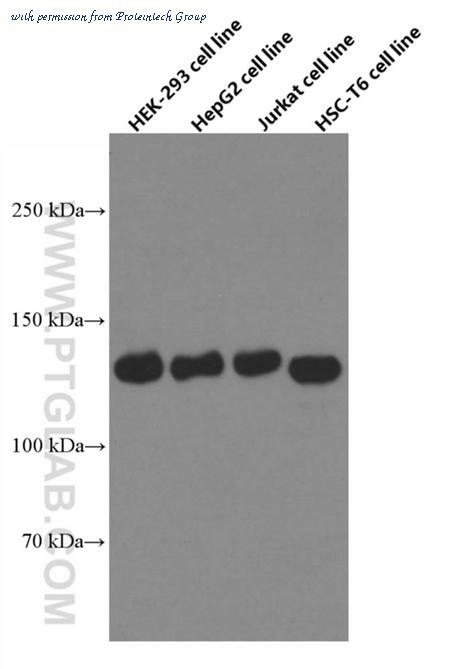 PVDF membrane was probed with 1 ╡g/mL of Rabbit Anti-Human GM130/GOLGA2 Monoclonal Antibody (Catalog # MAB81991) followed by HRP-conjugated Anti-Rabbit IgG Secondary Antibody (Catalog # HAF008 ). 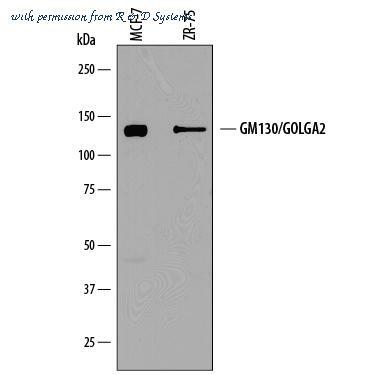 A specific band was detected for GM130/ GOLGA2 at approximately 130 kDa (as indicated). This experiment was conducted under reducing conditions and using Immunoblot Buffer Group 1 . Immunohistochemical staining of rat brain tissue using Giantin antibody. Immunohistochemical staining of human cervix cancer tissue using Giantin antibody. Immunocytochemistry/Immunofluorescence: GM130/GOLGA2 Antibody [NBP2-53420] - HeLa cells were fixed for 10 min using 10% formalin and then permeabilized for 5 min using 1X TBS + 0.5% Triton X-100. 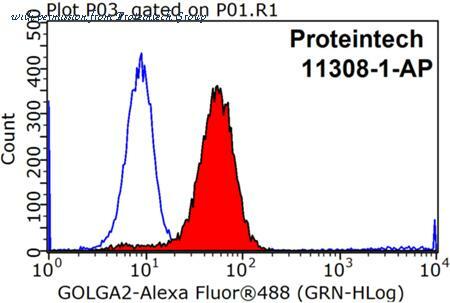 The cells were incubated with anti-GOLGA2 at 1:200 overnight at 4C and detected with an anti-rabbit DyLight 488 (Green) at 1:500. 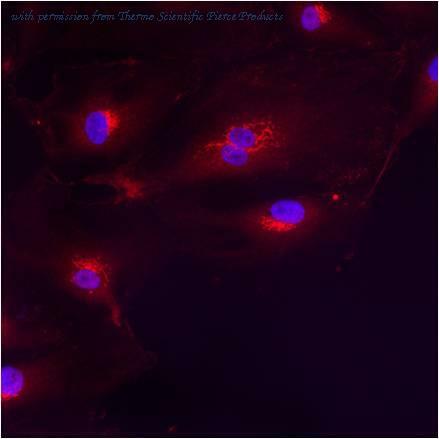 Alpha tubulin (DM1A) NB100-690 was used as a co-stain at 1:1000 and detected with an anti-mouse DyLight 550 (Red) at 1:500. Nuclei were counterstained with DAPI (Blue). Cells were imaged using a 40X objective. Western Blot: GM130/GOLGA2 Antibody [NBP1-89756] - Analysis using Anti-GOLGA2 antibody NBP1-89756 (A) shows similar pattern to independent antibody NBP1-89758 (B). 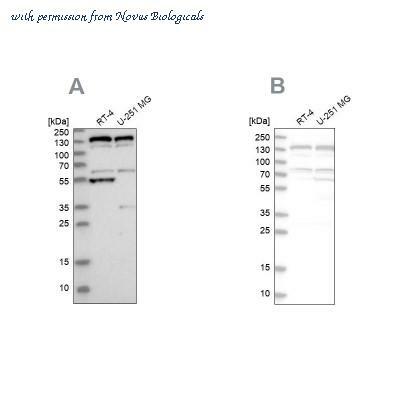 Western Blot: GM130/GOLGA2 Antibody [NBP1-89757] - Analysis using Anti-GOLGA2 antibody NBP1-89757 (A) shows similar pattern to independent antibody NBP1-89756 (B).